Heat cramps are painful muscles spasms that occur in the arms, legs, or abdomen that usually occur after several hours of exertion in the heat. In addition to muscle cramps, other symptoms of heat cramps may include faintness, dizziness, weakness, and excessive sweating. Usually, an athlete suffers from heat cramps after several hours of exertion and excessive sweating that results in dehydration. 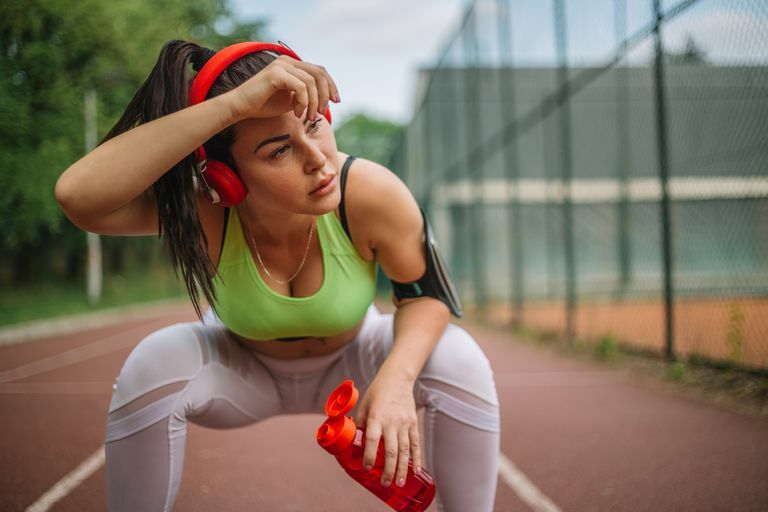 Muscle cramps are more common during exercise in the heat because sweat contains fluids as well as electrolytes (salt, potassium, ​magnesium, and calcium). When these nutrients, particularly sodium, fall to certain levels due to excessive sweating, the incidence of heat cramps increase. While all these theories are being studied, researchers are finding more evidence that the "altered neuromuscular control" hypothesis is the principal pathophysiological mechanism the leads to exercise-associated muscle cramping (EAMC). Altered neuromuscular control is often related to muscle fatigue and results in a disruption of muscle coordination and control. Stop activity, and sit quietly in a cool place. Drink a sports beverage with electrolytes (you can make you own sodium-based solution with 1/4 teaspoon table salt mixed in a quart of water). Hydrate well before and during exercise and replace lost electrolytes such as sodium, potassium, and magnesium with food or a sports drink (drink 16 to 20 oz/hour). Avoid exercising during the hottest time of day; train closer to sunrise or sunset. Wear light, loose clothing, so sweat can evaporate. Better yet, invest in some clothes that wick moisture from your skin to the outer layer of the clothing where it can evaporate more easily. Brands like CoolMax®, Drymax®, Smartwool or polypropylene all have this property. Cause of Exercise Associated Muscle Cramps (EAMC) — altered neuromuscular control, dehydration or electrolyte depletion? M. P. Schwellnus. British Journal of Sports Medicine 2009; 43:401-408. Muscle Cramp. The American Orthopaedic Society for Sports Medicine.